Palestinian terror attacks and West Bank leaders’ perceived support for violence are drawing new calls for cutting U.S. aid to the Palestinians, and groups that have traditionally supported financial assistance may not intervene to stop the cuts. Members of Congress and pro-Israel groups called for freezing U.S. aid to the Palestinian Authority in the wake of the latest attack on a Jerusalem synagogue that killed five and injured several others. "There is now a clear link to terrorism in both the West Bank and Gaza, and there can be no U.S. taxpayer dollars going to support a unity government that is backed by Hamas and the Palestinian Authority," said Rep. Ileana Ros-Lehtinen (R., Fla.) in a floor speech condemning the attack. Rep. Vern Buchanan (R., Fla.) also called for cutting off aid in a statement on Wednesday. "Releasing millions of hard-earned taxpayer dollars to the Palestinian Authority is outrageous," said Buchanan. "How can we justify this? We need to send an undeniable message to the world that actions do indeed have consequences." A recent bill introduced in congress by Rep. Ted Yoho (R., Fla.) addressed cutting aid to the Palestinian Authority. Yoho’s bill, introduced in September, would freeze financial assistance until the PA agrees to stop using the money to pay salaries for convicted terrorists. Pro-Israel groups in the United States and Europe also called for ending aid to the PA.
"It is unrealistic to expect that this will happen without the strongest international, including American, pressure on Abbas and the PA," said the Zionist Organization of America in a statement on Wednesday. "U.S. taxpayer-funded aid to the PA should be terminated forthwith until this is forthcoming, as the ZOA has been calling for for years." The National Council of Young Israel said the "condemnation from the Palestinian Arab leaders ring hollow without meaningful acts to eradicate these types of violent terrorist acts." "Therefore, the National Council of Young Israel calls upon our government to directly link any future financial assistance to the Palestinian Authority to the cessation of its habitual incitement, both in word and deed," the group added. "We also call upon the world community to suspend such aid until the acts of incitement cease." The World Jewish Congress called on European Union leaders to terminate aid until Palestinian incitement ends. While PA leader Mahmoud Abbas denounced the attack on the Jerusalem synagogue on Wednesday, he added that he also condemned "the attacks on the Al-Aqsa Mosque and the holy places." Abbas was referring to Jews who have tried to pray at the Temple Mount despite a ban by Islamic authorities. Palestinians have lashed out at Israel over an Israeli movement to promote Jewish prayer at the Temple Mount, the holiest site in Judaism and one that is controlled by Islamic authorities and off-limits to Jews. Israeli Temple Mount activist Yehuda Glick was wounded in a Palestinian terrorist attack late last month, in retribution for promoting Jewish prayer at the holy site. After Abbas’s denunciation of the latest synagogue attack, the official Facebook page for his political party Fatah reportedly posted a video and statement suggesting that his condemnation of terrorism was insincere. One of Abbas’s advisers praised the terror attacks on Thursday, according to Palestinian Media Watch. "Blessed be your quality weapons, the wheels of your cars, your axes, and kitchen knives," said Fatah Central Committee member Sultan Abu Al-Einein, according to a PMW translation. "By Allah, these are stronger than the arsenals of our enemy, because [they are being used] according to Allah's will." In the days leading up to Wednesday’s attack, PA officials had been praising and encouraging anti-Israel violence. Abbas himself described the terrorist who attacked Glick as a martyr who was "defending our people’s rights and holy places." 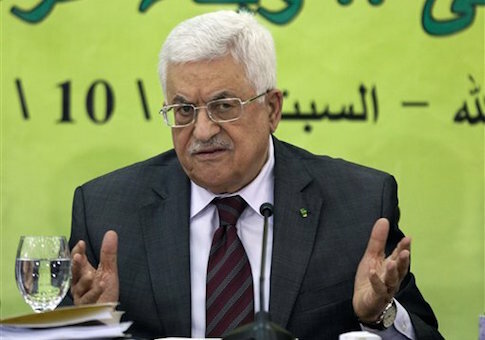 One official at a pro-Israel group told the Washington Free Beacon that frustration with Abbas has reached a peak in Washington. "Traditionally there have been two groups holding back Congress [from cutting PA aid]," said the official. "One was AIPAC, because aid promotes a two-state solution … and the other was the moderate Palestinians in town, most prominently the American Task for Palestine, and they're in a downward spiral [due to funding]." "If nature was allowed to take its course, Congress would probably cut aid to the Palestinians," the official added. "It's only voices from the Israeli and Palestinian side that have kept aid flowing in the cause of a two-state solution. But Abbas has been so horrible recently that he's endangering this. … Why would Congress spend money to promote the two state solution when this guy's undermining it all the time?" This entry was posted in National Security and tagged Ileana Ros-Lehtinen, Israel, Mahmoud Abbas. Bookmark the permalink.